Something that is so much fun to do, but that I forget about, is making a shaped card. It is so easy to get into a rut and keep turning out the traditional 4 1/4" x 5 1/2" card, either in portrait or landscape mode. 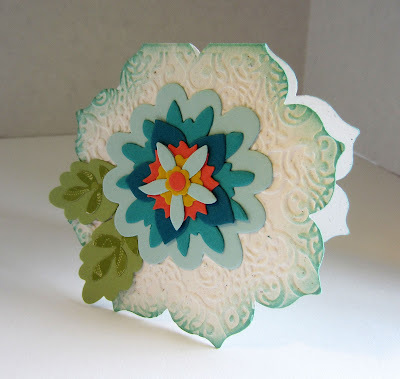 A simple, but cute, way to make a shaped card is to use some of the larger Framelits that are available. Simply measure the size of the Framelit you'd like to use for your card. For example, if your Framelit measures 5" x 5", cut a piece of cardstock for your base that measures about 5 1/2" x 10 1/2". Use the Simply Scored to score the piece in half. Crease it well with a bone folder on the score line. Since the Framelits cut easily through the two layers of cardstock, simply lay the folded card base onto the plate atop the Magnetic Platform. When placing the Framelit, be careful that the fold of the card comes just INSIDE the top of the Framelit. Top the sandwich with the remaining cutting plate. Then, when you run it through the Big Shot, the fold will not be cut through, and your card will open. B.U.T. it won't be rectangular or square. It'll be shaped like whatever Framelit you used. For my card today, I used the second largest of the Floral Frames Collection Framelits (page 173). When using this Framelit, it works best if you have two of the petal tips on the fold line. Then, it stands up better for display, rather than trying to balance it just on one petal. Not good. Once you have your cute shaped card base, you can finish it off in any of a number of ways. I chose to emboss the front of my card. 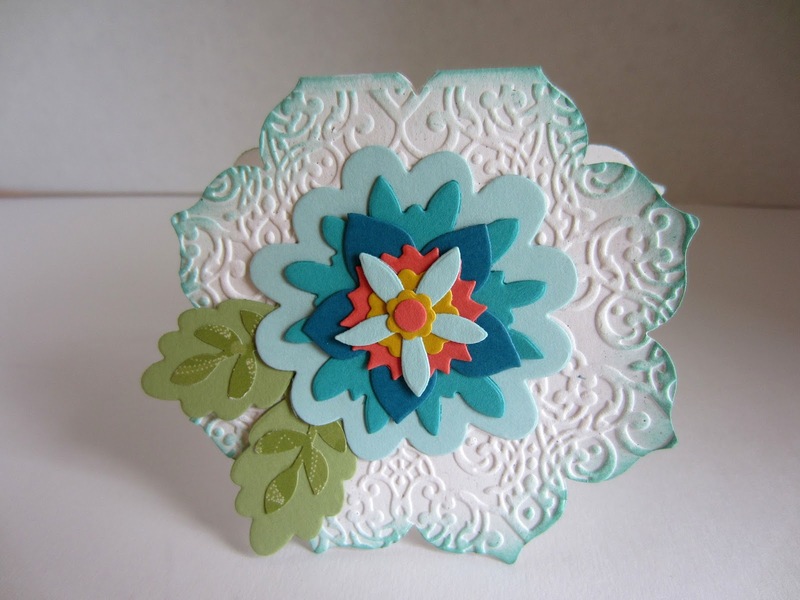 To create my flower, I grabbed another set of Framelits, the Flower Fair Framelits (page 172). The very center dot of the flower was punched with the 1/4" Hole Punch, and to make the "veins" on the leaves, I used the branch from the Bird Builder Punch (page 167). Otherwise all the other components were created with the Flower Fair Framelits. Gently sponging the edges with Pool Party ink gave the card a more finished look. At first, I was going to leave it un-sponged, but did not like how "bare" it looked. This looks much better. The following photo shows the card from a slight angle so you can see just how cute it looks when it is standing up on display. Use your imagination when looking at all the available Framelits. Which ones would make darling shaped cards? How about ANY of the sets on page 173? Think about even the Envelope Liners Framelits! One of those could be made into an adorable HOUSE! And it could be trimmed for Christmas. Or sent to someone who has just moved. A darling star card could be made with the Stars Framelits. The possibilities are ENDLESS! And, sometimes these cards become odd sizes. No problem! Grab your Envelope Punch Board, and make a custom envelope using coordinating paper to match your fabulous card! Love your card. I haven't tried making a shaped card yet. Those are super Pretty! Love!! Thanks for Linking up on My 2 Favorite Things on Thursday!! Hope to see you again tomorrow!! I love having You!! Pinned! !